It's a busy summer Thursday afternoon at the Sherlock Holmes Bookshop and Emporium on Cape Cod. The co-proprietor, Gemma Doyle, receives a phone call from a timid voice inquiring about a possible book signing but Gemma is fully booked for the summer. 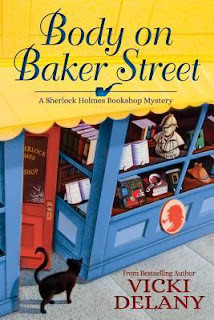 Until she hears who the author is- Renalta Van Markoff, author of a controversial, and wildly popular pastiche featuring Holmes and Mrs. Hudson. Gemma and her co-owner, Jayne Wilson immediately shift into high gear to accommodate her; no small matter as Renalta wants to appear on Saturday, just two days away. The flamboyant Renalta comes accompanied by an entourage; her mousy and timid assistant, her publisher, a publicist, an assortment of rabid fans and at least one enemy. Excitement is high, at least until Renalta collapses dead on the signing table. Gemma's customer, Donald Morris, a dedicated and somewhat stuffy Sherlockian is the prime suspect. Donald had attacked her verbally in the Q and A session, accusing her of defiling Sherlock's sacred memory. Gemma doesn't think Donald murdered Renalta, but who did? It's up to Gemma and Jayne to find out, using Gemma's incredible powers of observation. As a former bookseller and Sherlock fan, I really enjoyed the Body on Baker Street. Most of the authors I met at book appearances were gracious and down-to-earth people who were pleased to meet the fans and made no unreasonable demands. Then there were the one or two who were nearly as demanding as Renalta. The fans sometimes, too, could be a little odd. I'm looking forward to the next in the series and I highly recommend it for cozy fans. Thanks to NetGalley and Crooked Lane Books for an advance digital copy. The opinions are my own.